What Is the Day Z Creator More Afraid of Than Zombies? Loyal Fans. 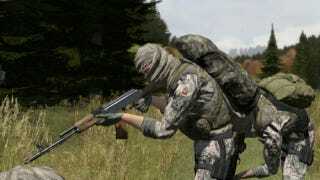 Day Z, the apocalyptic survival mod developed for Arma II, has taken the world by storm. Over half a million players have downloaded it, it's causing sales of a reasonably obscure three-year-old game to skyrocket, and some folks are calling it the best zombie game ever made. And while half the best experiences and stories come from player behavior, the mod itself is the work of one man, Dean Hall. It's gone from being a little experiment in a lab to being in some particle collider in Europe somewhere. It's taken on a life of its own, which has impacted on the ability to do anything. It's scary and it's also fun at the same time. In a way, the project is basically about two or three hours away from complete disaster at any time. Every time we do an update it's just terrifying. And a lot of people get very frustrated when things go wrong. For Hall, in some ways it's a good problem to have. When people care about your game, you're clearly on to something, and have made a product worth caring about. But, he observes, the community is in some ways entirely at odds with itself, showing both sides of the coin at all times. "There's the side that will just support anything that happens in the project, and then there's the side that's very critical of things that happen but continues playing." DayZ, in that sense, finds itself in familiar territory. As controversy over Mass Effect 3 this year has demonstrated, fan goodwill is hard to chase and harder to hold onto. Nintendo of America president Reggie Fils-Aime spoke earlier this year about the never-satisfied gamer and how hard it is to find the sweet spot to please insatiable fans. It's easy to understand why Hall feels so worried. Gaming communities and terrifying undead are not always as dissimilar as we might hope.